Albert Whitman & Company, 9780807565384, 32pp. Fall is here, with all its wonderful visual delights—not just colors, but shapes! 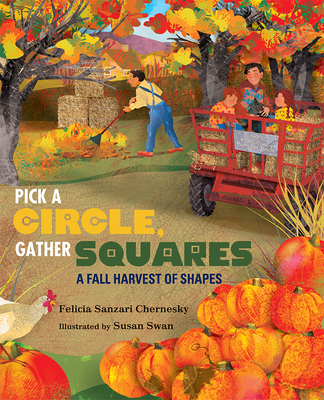 This clever concept book follows a family on a trip to a pumpkin patch and invites children to pick out shapes from the seasonal scenery—apple bushel circles, square hay bales, diamond kites in the autumn sky! Felicia Sanzari Chernesky’s sweet verses are perfectly complemented by Susan Swan’s gorgeous collage-inspired art. Felicia Sanzari Chernesky was born in Memphis, Tennessee, and raised in Parsippany, New Jersey. A University of Pennsylvania graduate, she is completing an MFA in Poetry with a focus in Versecraft at Western State Colorado University. A longtime editor, she lives in Flemington, New Jersey with her husband, kids, cat, and poetry volumes. This is her first book. Her website is www.feliciachernesky.com. Susan Swan is the illustrator of many books for children, including Volcano Rising, Out on the Prairie, and When Autumn Falls. She lives in Ovilla, Texas. Her website is www.susanswan.com.